The immigration-court backlog grew during the government shutdown. Louise Radnofsky from the Wall Street Journal discuss has the story. President Trump skeptical he would accept any Congressional border deal, Louisiana suspect in killing of 5 captured in Virginia, and private colleges close due to rising expenses. Shutdown talks revived after bills fail, get ready for an unhappy tax surprise, and should the day after the Super Bowl be a holiday for chicken wings. Shutdown drama shifts to Senate, President Trump delays State of the Union, and sweethearts candy missing from shelves this year for Valentine's Day. Senate leaders push votes on dueling bills to end shutdown, Supreme Court accepts first gun case in nearly a decade, and makeup is the new workout gear. 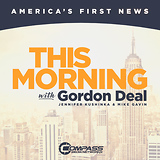 Emily Cochrane from the New York Times and Gordon Deal discuss the fraught relationship between Mitch McConnell and Nancy Pelosi. Senate to weigh President Trump's proposal to end shutdown, Democratic Senator Kamala Harris will run for President, and its time to pay your holiday bills. As the partial government shutdown enters its fifth week with no end in sight, the federal courts are running out of money. Thomas Kaplan of The New York Times explains. President Trump warns Nancy Pelosi to 'be careful' after Democrats signal they won't accept his shutdown offer, winter storm slams east, and military eyes 'space-based layer of sensors' in new missile defense. What the fight over Trump's border wall is really about, President Trump's former fixer sought to skew poll data, and the best and worst U.S. airlines of 2018. Americans killed in Syria ISIS attack, wall impasse frustrates many newly elected House Democrats, and outpouring of generosity for TSA workers. Ben Mutzabaugh from USA Today gives us a look at how traveling during the government shutdown could turn into a boondoggle. Gunmen kill 15 in Kenya hotel compound attack, William Barr seeks to ease Democrats' concerns, and the average kid's allowance rose faster than American workers' salaries in 2018. House GOP removes Steve King from panels following comments on white supremacy, Democrats draft bills to end shutdown, and how the shutdown hurts craft brewers. The government shutdown enters week 4, winter storm turns deadly, and get ready for hashtagable winter events. U.S. towns with federal workers brace for impact as the shutdown continues, Boy Scout projects hope to keep schools safe, and the power of a slow morning. President Trump walks out of shutdown talks, vulnerable GOP senators feel the heat, and how estimates of the gig economy went wrong. What will is take for the border wall standoff to end? Jerry Seib from the Wall Street Journal has the story. Shutdown continues as President Trump makes his case for a border wall, U.S.-China trade talks conclude as hopes of a deal build, and cancer deaths have declined over the past 25 years. House passes spending package in bid to end shutdown, drugmakers are defying Trump and raising prices, and the exact number of days it takes to turn a resolution in to a habit. Democrats prepare to take control of House, where will interest rates be headed in 2019, and restaurant owner calls out alleged dine-and-dashers. Looking at the latest in the partial government shutdown, incoming Senator Mitt Romney pens OP-ED slamming President Trump, and Tom Brady overestimated himself and lost $5 million in bonuses. Daniel Lippman from Politico joins us live with the latest news regarding the government shutdown, including which politicians are negotiating behind the scenes.